Jens Andersson Tynjo (Tønjum) came to America aboard this ship in 1868 (Bergen, Norway to Quebec, Canada). Built in 1848 in Bath - Maine - USA. The ship was built by George F. Patten. In 1864 it was bought by Chr. Castberg, later sold to Fredrik Host (Sandefjord), sold 1873 to GB/USA. Captain from 1864 to 1872 was J. Chr. Andersen jr. Dimensions: Length 152,2 feet x beam 33,6 feet and depth 16,9 feet. Material: Wood, Tonnage: 436 cl. 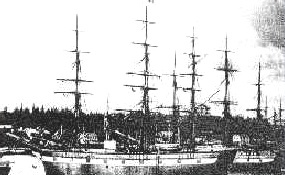 Jens' mother, Rannveig Torsteinsdatter Horge, and siblings, Torstein and Anna Anderson came to America aboard this ship in 1872 (Bergen, Norway to Quebec, Canada). Ingeborg Henriksdatter (Hogenson) came to the U.S. aboard this ship. The Frigate Bird was built at Baltimore in 1853. Her dimensions were: Length 145 feet, breadth 29 feet, depth 16 feet and draught 18,5 feet. When she sailed in 1871 she was rigged as a ship. Later the she was rigged as a bark. Tonnage (in 1880) was 566 Norwegian Int. tons. Ship captained by Capt. Sørensen, left Bergen and arrived in New York June 18. Jens Olsson Tønjum (Uncle to Jens Andersson) Tynjo/Tønjum) and his family came to the U.S. aboard this ship in 1851. 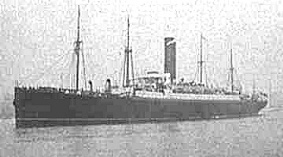 The Wilhelm (William) Wolff family came to the U.S. aboard this ship. Burden: 2,684 Gross Built: 1857 in Greenock at Caird & Co.
1879 Sold to Russia and renamed "Nijni Novogrod"
If you have photos of any of these ships, please send us an email. Thanks for visiting the Ships Page.